My Israeli Street Cat Turns 13 – That’s Stray Longevity! Life on the streets has never been easy for stray animals, especially in the Middle East where animals are often targets. There are stray dogs that get shot dead in Lebanon and stray dogs that kicked around in Jordan. 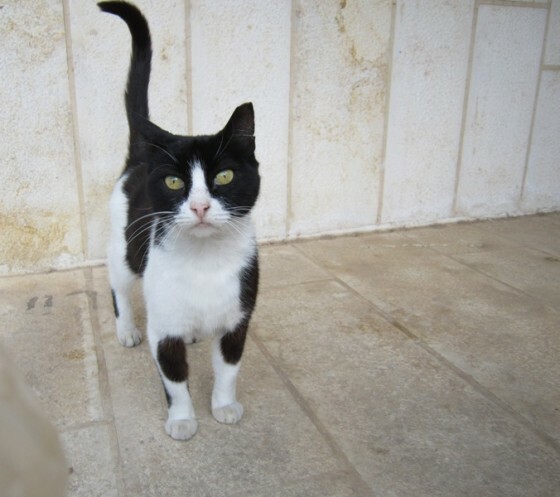 In my Netanya, Israel suburb of Ramat Poleg, stray or street cats are so commonplace that most residents now take them for granted. One of these animals, a black and white cat I have named Piddy Poo or Pudi, recently turned 13. Reaching this age, which in human terms is around 90, is a milestone for any cat, whether stray or owned. Not only has she reached this advanced age, she has done so under difficult circumstances; and has managed to give birth to and raise numerous litters of kittens. She has had some human assistance, of course, as several area residents, including me, have fed her along with other area cats. This alone has enabled her to actually outlive several of her children who have since died from disease, being run over by cars and other events. I have been feeding her almost from the beginning, and her tenaciousness as well as probably some strokes of good luck have enabled her to live so long. Pudi was “fixed” a few years back, which has prevented her from having any more litters. There is no national program to do this and having street cats spayed or neutered has been on an individual basis only; usually done by concerned veterinarians who charge little or nothing for their services. Some cities in Israel, like in Tel Aviv, will do this for free if you call them. Other countries, including Egypt, Jordan and Lebanon haven’t been so kind to their abandoned and feral street animals however. There are concerned people living in various Middle East countries who are trying to educate people to be more kind to strays as well as to their own pets. In Jordan, a petition is being circulated to persuade the government to be more involved in stopping the brutal killing of their stray animal populations. These programs are only a very small beginning, however, as stray as well as kept animals are abused and killed on a daily basis. Israel fares only marginally better as stray dogs and cats are frequently poisoned or rounded up to be “put to sleep” later. Israel’s stray animal shelters are almost always filled to over capacity with precious few animals actually “adopted” into homes. As for Pudi, she continues to wait for me every day for whatever kibbles I can bring her. The fact she has lived this long is an indication that she adheres to the old adage of survival of the fittest. Next Next post: If Gaza Goes Dry, Where Will All the People Go? Now the neighbors want to get rid of Pudi and her cat friends. Any helpful comments to prevent this from occurring will be appreciated. She looks like she smells better then our lazy, smelly cat, who has a home. Smell is OK. You know it is there. No need for bell on collar. I prefer that I not know he is here. His smell resembles the street ghettos. Well, cats do have 9 lives. I was amazed to read that a 13 year old cat is equivalent to a 90 year old human. My daughter had a cat that lived to age 19!